Exposure affects much more than just how light or dark your photo is, although it certainly affects that. The same controls that determine exposure levels also largely control whether the background will be blurred out or in focus. They also control how much “noise” is in the picture. And they also determine whether the action will be frozen or appear blurred. So exposure is the fundamental thing of photography. The good news is that understanding exposure is not that difficult. Despite the dizzying number of buttons and knobs on your camera, exposure is entirely controlled by only three (3) controls. The names of these three controls are Shutter Speed, Aperture, and ISO. We’ll come back to them in the next article (on Controlling Exposure). For now, let’s start by introducing you to exposure and showing you you how a camera works. To do that, I’m just going to walk you through 4 super-simple diagrams. Digital Image Sensor: this is the digital equivalent of film. It is a flat, rectangular device inside your camera that records whatever image that is reflected on it. It is essentially the thing that creates the picture. 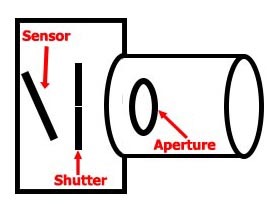 Shutter: this is what keeps light from reaching the digital sensor except when opened by the photographer (by pressing the shutter button). This is essentially the trigger mechanism for taking pictures. Aperture: this is a hole in the back of the lens through which light is funneled into the camera. Although light comes through the aperture of the lens, it is blocked by the shutter. No light reaches the digital sensor, so there is no image to record. Nothing happens. Now the shutter is opened up to let light onto the digital sensor. The digital sensor captures that light and records a picture. This diagram shows the camera parts again (in red) that control exposure. These are the same things that have been labeled in each of the diagrams above. Each of these camera parts can be controlled by the photographer. I have labeled (in blue) the controls along with the corresponding camera part. These are the 3 controls for camera exposure I mentioned earlier: Shutter Speed, Aperture, and ISO. If you are shooting in an automatic mode, your camera is setting these 3 controls each time you take a picture. Our goal is to ultimately get to the point where you understand and use each of these 3 controls yourself to get exactly the exposure you want. But that is for another day. For now, just get your head around how these three camera controls operate to allow light into the camera to expose a picture. In the next article (on Controlling Exposure), we will cover how these controls behave. After that, you will have a solid understanding of how exposure works on your camera.